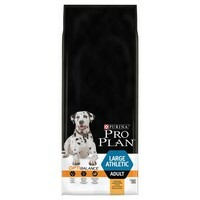 Purina Pro Plan OptiBalance Large Athletic Adult Dog is a complete food specifically formulated for large breed dogs with an athletic physique. Made with a combination of specially selected vitamins and minerals, Purina OptiBalance meets the specific needs of a larger breed dog and helps them to stay in a healthy condition. It has been balanced at optimum levels to ensure your dog absorbs all the key elements in their food, and will help look after your dog’s dental health as well as supporting healthy joints.